Discover the uniqueness of Bogota through a sophisticated guide to satisfy all senses. The capital of Colombia has a wide range of leisure offer which needs to be filtered and sorted. Bogota Exclusiva App comes to respond this need: connecting the leisure supply of highest quality with its prospect in a unique showcase through the smartphone or tablet. 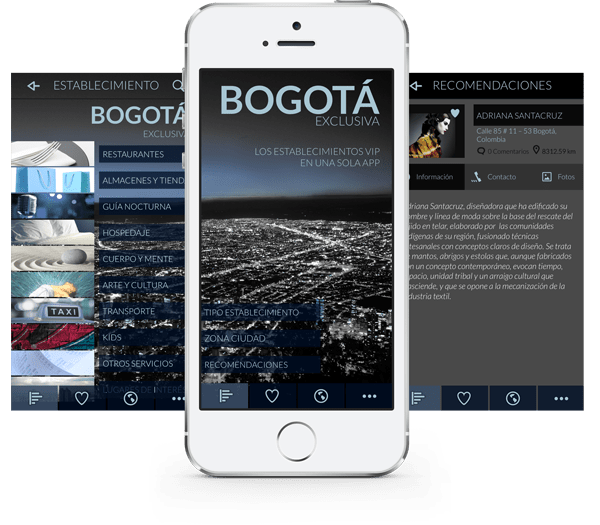 Bogota Exclusiva App (free download) offers a dynamic and customizable guide to know where to lodge, eat, go shopping, have some drinks, dance, enjoy art and sport or just learn what to do in your free time. It is constantly updated by the establishments in order to establish a direct dialogue with their audience in real time. There are different options to easily and quickly find what you are looking for: by category (restaurants, nightlife, transport, beauty, family activities…); by city area or the closest to your position. And with the possibility of saving your favorites, sharing on social networks or leaving comments. Renowned designers such as Adriana Santacruz, Mauricio Guerrero or Mario Hernandez. Retailers and shops such as El Retiro shopping center, Don de Origen Noble, Estibol. Interior decoration businesses such as Eurolink or Pas De Deux. Art Galeries such as Valenzuela Klenner or ATGallery. Spa services such us Dolly Devia or Vital. Restaurants such as Alice’s Cherries, Daniel Dine & Wine, Arte y Pasion Cafe. Paintball Al Límite, DzG Parlour Tattoo, MiTaxi… They all opted for Bogota Exclusiva App before it was launched as they know it is an innovative, unique and effective tool to position their products and services. They also have their own administrator to update the information at any time. The application is now available for iOS on the Apple Store and for Android on Google Play, both for tablet and Smartphone. The launch of Bogota Exclusiva App will be also reinforced through a campaign on MiTaxi vehicles, the most renowned and trustful transport business of Colombia, and with a seal of quality which will be received by the establishment included on the app. Bogota Exclusiva App is a product by Cuatroochenta which also means its implementation in Colombia with its own office. Cuatroochenta developed a commercial management application on tablet for Faes Farma -the fourth pharmaceutical company in Spain- which meant the first incursion in Colombia (where it was first implemented). Now, after opening an office in Panama, the Spanish company continues to expand horizons in Latin America.